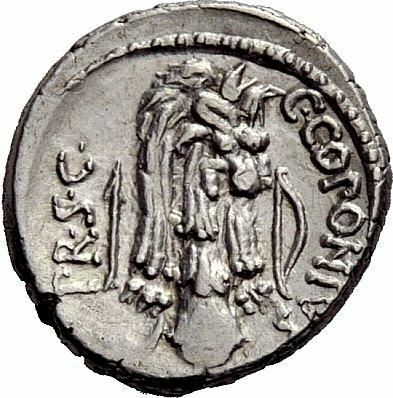 C. Coponius was Praetor in 49 BC, and struck coins in that respect jointly with a moneyer for the year, Q. Sicinius. He was formerly an officer under Crassus. He was a supporter of Pompeius Magnus. In 43 BC, he was proscribed by the Triumvirate, but was subsequently pardoned, and came to be regarded as a greatly respected member of the Senate. Gens Coponia was a plebeian family at Rome. The family was prominent at Rome during the first century BC.